Bring the fun of horseback riding to life and play with Barbie® doll like never before with her most interactive horse yet. The Barbie® DreamHorse™ reacts to touch and sounds - it features more than 30 realistic reactions! This amazing animal can walk forward, turn 360 degrees and neigh when you play. DreamHorse™ can also feed (a bunch of carrots are included) and nuzzle in response to your touch. For even more fun, DreamHorse™ nods yes or no when you ask a question! It can also play three songs and show off with three different dances. 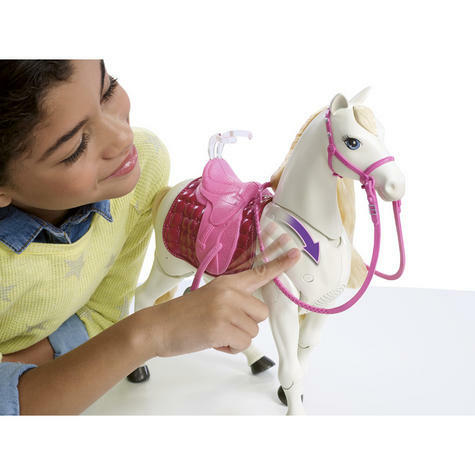 You and Barbie® doll can groom the horse's super-long, curly mane and tail with the included brush. 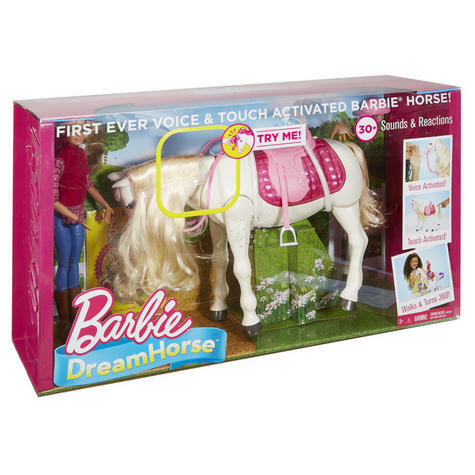 And of course, Barbie® doll can sit on the saddle -- just use the included waist clip -- to ride along wherever DreamHorse™ goes. 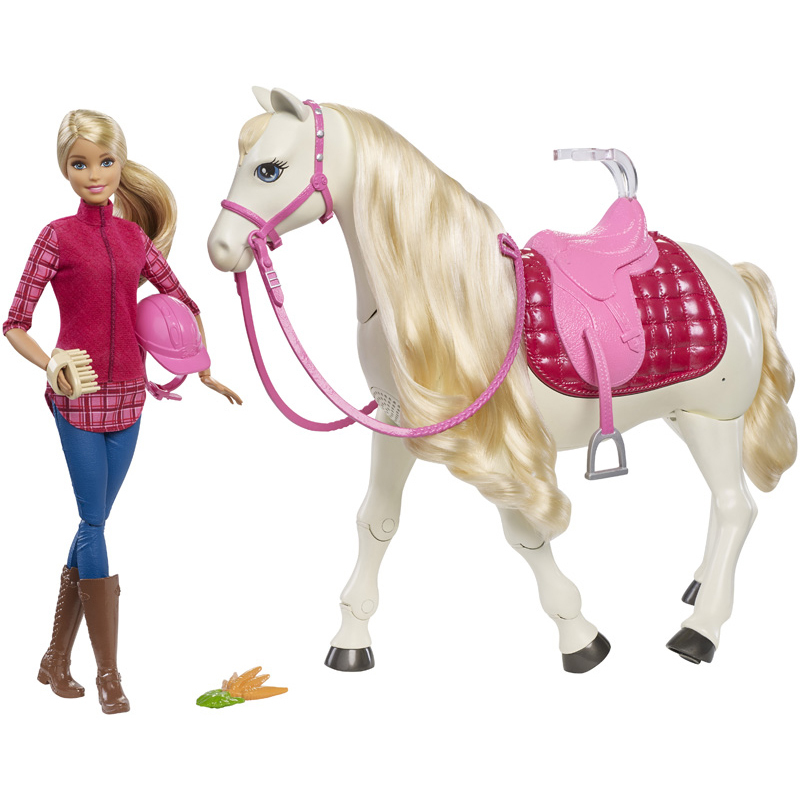 Barbie® doll is ready to ride into your imagination wearing a riding tunic, molded pants, removable boots and a helmet. Her beautiful DreamHorse™ matches with a pink saddle and reins. Includes Barbie® doll wearing fashions and accessories, interactive horse with saddle and reins, bunch of carrots, brush and helmet. Doll cannot stand alone. Colours and decorations may vary. 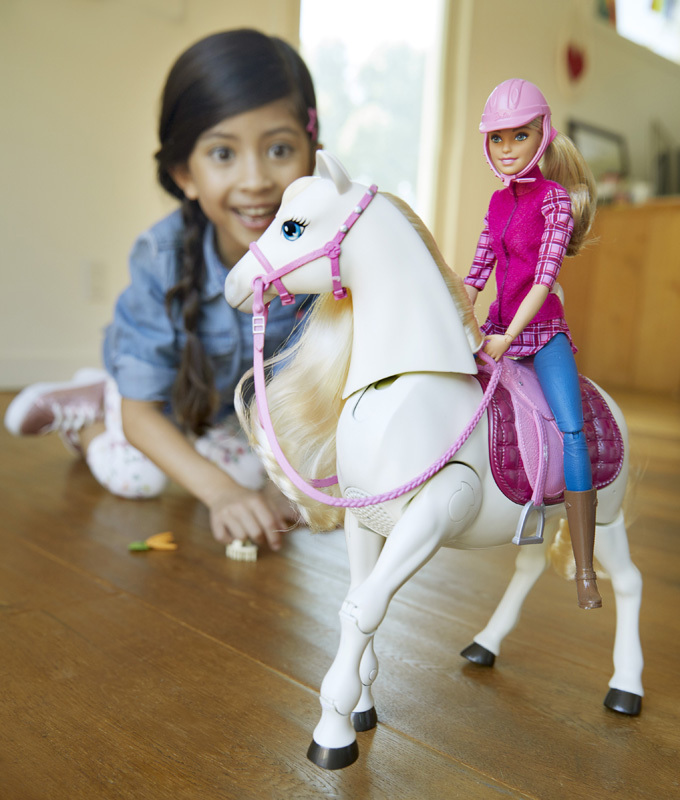 Experience the fun of horseback riding with Barbie®doll with a DreamHorse™, her most interactive horse yet! The pretty white horse responds to actions and touch withmore than 30 realistic reactions that bring the beauty of horses tolife! DreamHorse™ can walk forward, turn 360 degreesand neigh when you play. Barbie® DreamHorse™ can feed with anincluded bunch of carrots and nuzzle in response to your touch. DreamHorse™ nods yes or no when you ask aquestion! Press the button on the saddle, and theDreamHorse™ can play three songs and dance three dances. Groom the horse's super-long, curly mane and tail with theincluded brush. 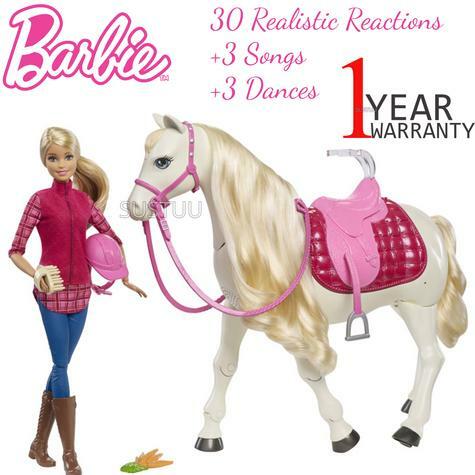 Place Barbie® doll on the saddle -- just use theincluded waist clip -- so she can ride along whereverDreamHorse™ goes. 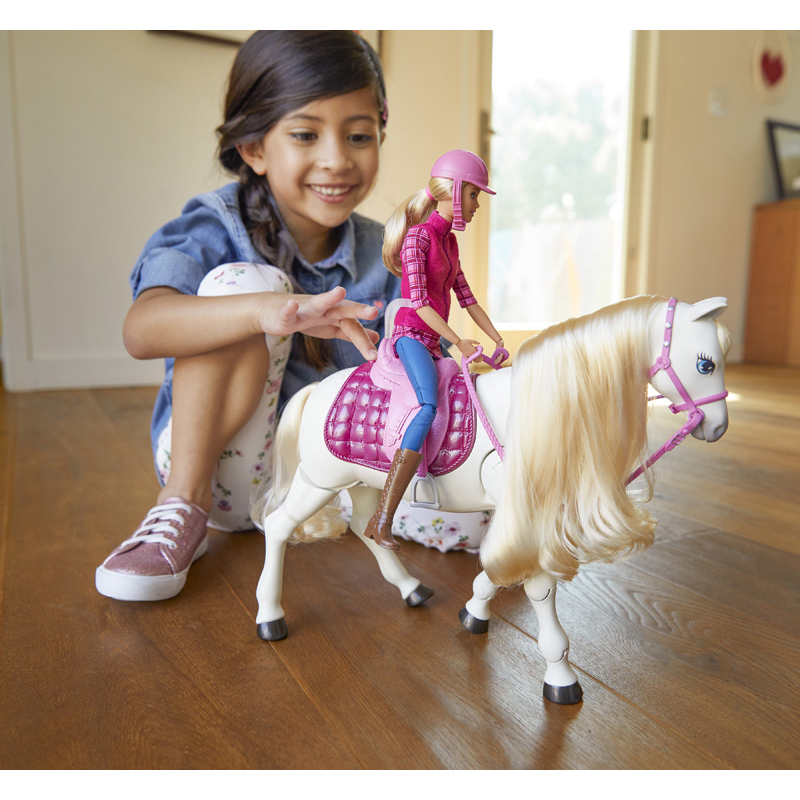 Barbie® doll wears a pink riding tunic with plaidsleeves, blue pants, tall brown boots and a pink helmet. 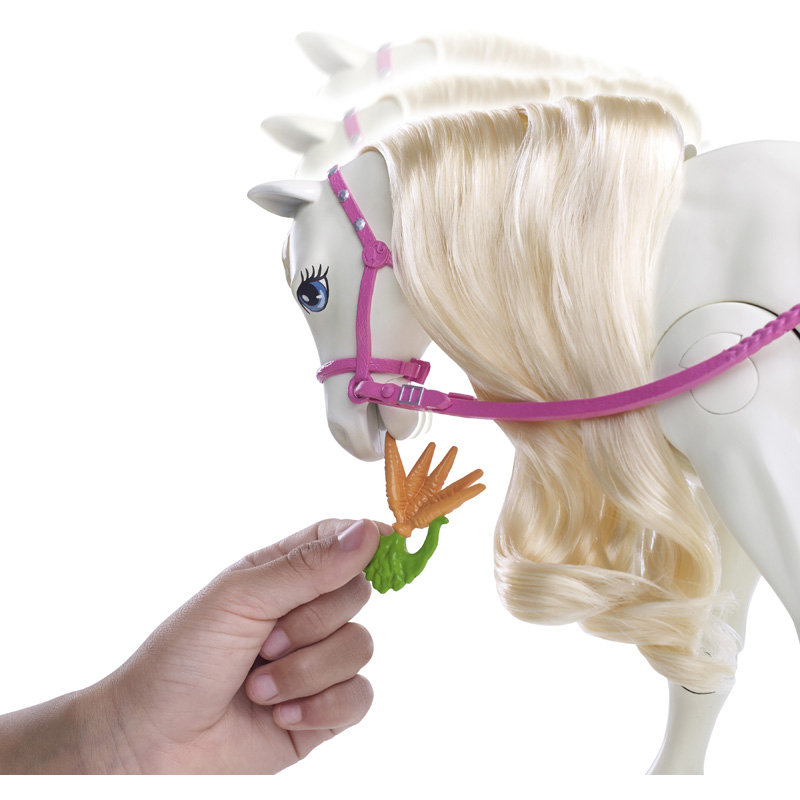 The beautiful white DreamHorse™ has a pink saddlewith reins and the doll waist clip. 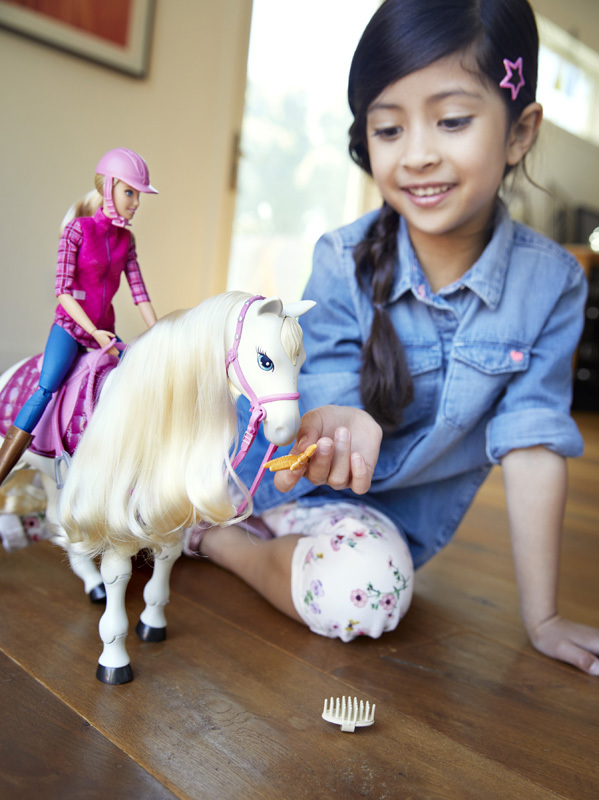 Use the brush to help Barbie® doll groom the longmane and tail and add to the nurturing fun. Young horse lovers can let their imaginations ride withBarbie® doll and her interactive DreamHorse™!"